The competition, known as the Pentathlon Meet, consists of five events: the 50-yard butterfly, 50-yard backstroke, 50-yard breaststroke, 50-yard freestyle and 100-yard individual medley. The men’s and women’s teams both showed a great deal of promise for the upcoming season. “This team is incredibly strong and versatile,” said women’s team captain Annabelle Hopkins ’19. “We did a great job filling in the gaps [on our roster].” Hopkins noted that the team’s breaststroke program has particularly improved from last season. Griffin Campbell ’19 and Molly Likins ’22 finished first in the breaststroke for their respective teams, and Cameron Gelwicks ’19 and Emma Fikse ’19 each took the top spot in the freestyle. Gelwicks also won the individual medley for the men, along with Brooke Brown ’21 for the women. Trey Schopen ’20 and Kalla Sturonas ’19 earned top butterfly honors, while Josh Gluck ’21 and Kate Murphy ’21 were masters of the backstroke. The swimmers likely felt much safer and more comfortable than last year due to the new and improved pool, which saw its first action after undergoing a badly needed renovation in the offseason. The renovation was the long-awaited result of a movement led by Hopkins, who in 2017 authored a 10-page document to the College’s Board of Trustees detailing the many problems with the old pool. Hopkins goes on to describe the numerous flaws the pool had at the time, including poor ventilation that endangered asthma-afflicted swimmers, a moldy, falling-apart ceiling and rotting pool tiles that caused swimmers to get cuts on their hands and feet. The pool was also illegally shallow for diving competitions and did not have enough space for multiple teams to practice at once, forcing the teams to practice at different times and leaving less time for the pool to be open to the public. According to Athletic Director Keith Beckett, renovations included a new filtration system, new disinfectant system, repairs and replacement of pool tiles, repairs to the air handling system, repairs to the bleachers and replacement of lighting, among other improvements. It has finally happened now, and things are looking up for the Fighting Scots swimmers and divers. 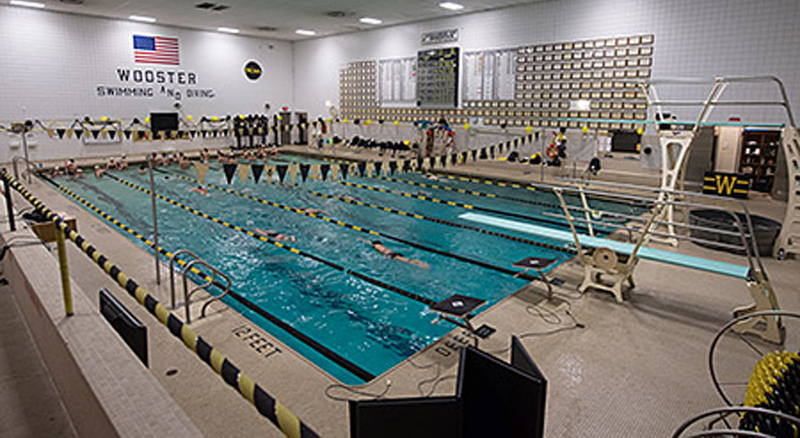 On Saturday, Sept. 29, The College of Wooster will host the Black & Gold Alumni Swim Meet at the newly renovated Timken Natatorium. This will be another friendly event in which alumni swimmers return to compete. Come out to support!